This is the introduction to a new report written by Joel Kotkin and Michael Lind with a team of contributors. Download the full report (pdf) here. The fulcrum for meeting these challenges is the combination of industries and resources concentrated in the New American Heartland, the center of the country’s productive economy. Traditionally, the Heartland has been defined as the agriculturally and industrially strong Midwest, alone or perhaps together with the Upper Plains. However, the geographic distribution of US manufacturing and energy extraction has expanded through the growth of new manufacturing zones, largely in Texas, the South and the Gulf Coast. Our map of the New American Heartland includes not only the Midwest and Upper Plains, but portions of all the Gulf States — Texas, Louisiana, Mississippi, Alabama, Florida — and the non-coastal southern states of Georgia, Tennessee, and Arkansas. It comprises most of the US between the Rocky Mountains and the Appalachians. The New Heartland incorporates the old Midwest and much of the South. Alongside it, the new continental periphery consists of the mountain and desert spine of North America from Mexico through to Canada, a region that is likely to remain thinly populated and devoted to resource extraction, tourism and wilderness preservation. 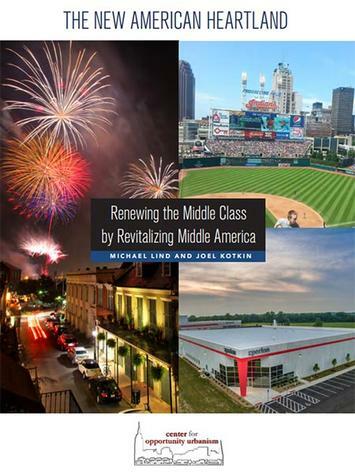 While every region contributes to American prosperity, the New American Heartland has the potential to play an outsized role in powering economic growth in the twenty-first century.